I've been on a bit of a chocolate spree as of late, but I've just moved cities, so I've had to familiarise myself with nearby shops, and I have stumbled across the most exciting blends and types of chocolate, not least being the Noir Araguani - 72% cacao - chocolate bar I found in WholeFoods. This is one of the most intense chocolate bars I've tasted, save for a Guittard baking bar. 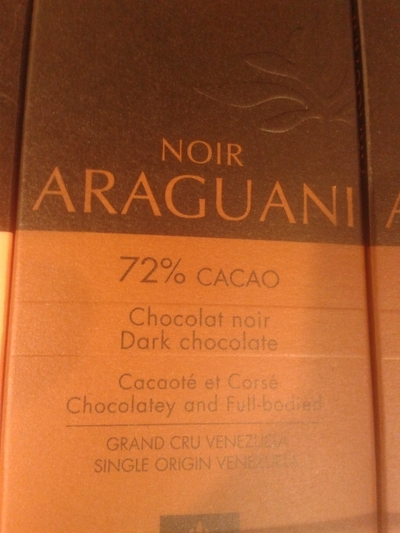 Araguani chocolate (£2.50) is made from rare Venezuelan cocoa beans, it has flavours of currants and chestnuts with hints of honey and fresh baked bread. Noir in the title refers to both the shade and taste of the chocolate - it is very near black in colour, and it has a typical bitter taste associated with dark chocolate. I don't recommend eating this chocolate like you would a normal chocolate bar. I have been known to munch on a few squares of dark chocolate with a high cacao count like this, but this one is very intense. I tried the one square of this, and though tasty, the fruity notes make it better for baking. Since trying the dark chocolate (four days ago), I have baked low-sugar chocolate oat bites, which my mother and sister both loved. They're not fans of dark chocolate, and I only added a small amount of sugar to sweeten the oat bites, but considering the bitterness of the chocolate, I only needed to use a little sugar (honey), to bring out the flavour of the chocolate, as well as a little salt for seasoning. Of all the dark chocolates I have used to bake with, Araguani is definitely in the top three. When melted over a bain-marie it becomes silky, and doesn't burn (some dark chocolates do, which is a real shame). This bar is made up of 72% cocoa, 27.5% sugar and 44.1% fat content. The few ingredients make it a dream to work with - add cream, just the right amount of salt, and you're basically making your own chocolate bar. It has a shelf life of 14 months, so if you're a rare, or sporadic baker, don't worry - this keeps for over a year. Happy baking.